What is interval weight training? And what does it have to do with YOU losing weight? Look, this has something to do with you -- and with you finally getting the body you want. And no, it's not too hard for you. First, let's make it clear what we are talking about. Weight training is any exercise that is done with weights. Sometimes you use weights because you want to make the exercise harder. Why harder? You make it harder in order to stimulate muscle growth. For instance, if pushups are too easy for you -- or if your goal is to build increased muscle mass and strength -- you can switch to the bench press and put on as much weight as you can handle. If pushups are too hard for you, then you use weight training to make it easier. 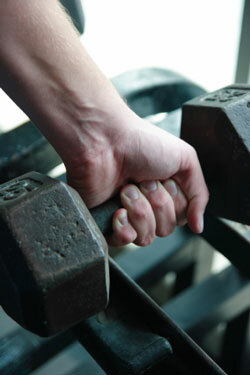 That's the key -- using weight training to make exercise easier. Instead of a pushup you can do bench press. You exercise the same chest muscles. Or you can use something as light as a can of soup. So you see weight training -- far from being for the big bodybuilder -- is the one kind of exercise anyone can do. But you usually think of weight training when you want to build muscle. So how does it fit in with interval training? One, it lets you get your heart rate up and revs up your metabolism to help you lose weight. Two, it gives you breaks from the more intense exercise and lets you recover. So you can work out hard without collapsing and you get the most benefit from your exercise time. Now, you usually think of things like sprinting, treadmill or stairmaster when you are doing interval training. So what does interval training have to do with weight training? It gives you that rocket-boost to your metabolism which helps you melt away those extra pounds. And it builds up muscle mass through weight training which tones, trims and makes you more attractive. So if you want to be lean and fit it is time to add this interval weight training regimen to your routine.